In the evening of June 16,1965, a wall of water described by some as 15 feet high roared down the South Platte River, the result of extremely severe thunderstorms many miles south of Littleton, Colorado. By midnight, the torrent crested at twenty-five feet above normal and was carrying forty times the normal flow. 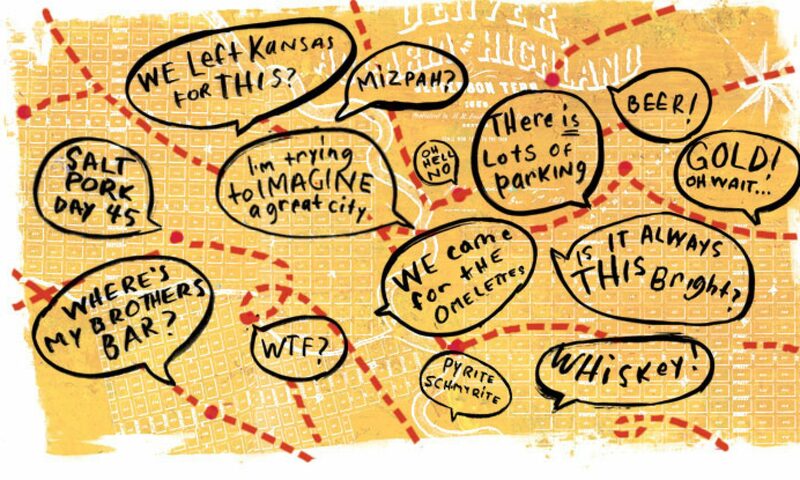 In its wake, the course of the South Platte River from Littleton to the Colorado-Nebraska border was a mud-encased, wreckage-strewn landscape of desolation. The great South Platte River flood of 1965 was one of the biggest – and costliest – in the history of Denver. I was between my freshman and sophomore year at the University of Denver, a journalism major with dreams of becoming a photojournalist for the Denver Post when I graduated college. On that very day, June 16, I had become the proud owner of a new Nikon F 35 mm camera and two lenses: the standard 50mm and a 200 mm telephoto! I was in photojournalist heaven! As the radio reports followed the disaster, I talked a D.U. friend into driving us downtown, so I could use my new camera and capture images of this historic event. At one point a Denver policeman confronted us, saying, “You do not have permission to be this close to the river. Get going!” I responded by telling the officer I was photographing the flood for the University’s student newspaper, the Clarion, and yearbook, the Kynewisbok. This did not impress the cop who said I would be arrested if I stayed. Well, we left that spot, but I was able to photograph the flood and its aftermath. B50 Note: The two most serious floods in the history of Denver were separated by 101 years; 1864 and 1965. The 1965 flood caused extensive damage from Littleton through Denver, especially along the Valley Highway (now known as I-25), prompting Congress to provide funding for Chatfield Dam. Dennis Bauer is a Denver native who has spent the past 20 years working as a teacher. When he retires in two months, he plans to grow his photography business, db Photography. Text and photographs are courtesy of the author. The following audio remembrance of the Denver Flood of 1965 was recorded by Charles A. Roessler. Mr. Roessler is a retired member of the Denver Fire Department. By the late 1950s the Denver area was one of the fastest growing in the United States, and something both new and old residents needed was entertainment. There were plenty of options. For those seeking fast rides and other thrills there were Lakeside Amusement Park and the old Elitch Gardens. Those more interested in sports had swimming, golf, the Denver Bears baseball team, and college sports teams, among many other choices. But the one problem plaguing these forms of entertainment was that, to varying extents, foul weather could hamper one’s enjoyment of them. When Lakeside opened in 1908, the Denver Republican praised the summer resort as a welcome addition to Denver’s recreation needs. Nature, the Republican wrote on May 24, 1908, had done a good job of supplying Denver with winter amusements, but the city had never had “an open air playground in keeping with the demands of its cosmopolitan and thoroughly discriminating population.” By 1959 the exact opposite attitude seemed true—Denver was sorely in need of amusement options for the winter, or at least options that were impervious to bad weather. In late 1959 a group of investors joined forces on a project that could offer hours of amusement regardless of the weather while also improving the lives of the area’s young people—a priority for one of the investors. On November 15, 1959, The Denver Post announced that a “huge play center” was in the works for southeast Denver. According to the Post, the center was to include an eighty-lane bowling alley, a massive indoor swimming pool, restaurants, a lounge, and a health salon. 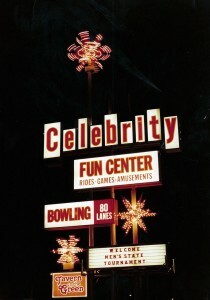 The center would be owned and operated by Celebrity Bowling, Inc., a recently formed corporation based in Los Angeles. While none of these activities were especially original, what was unique about the future Celebrity Sports Center was its ownership. 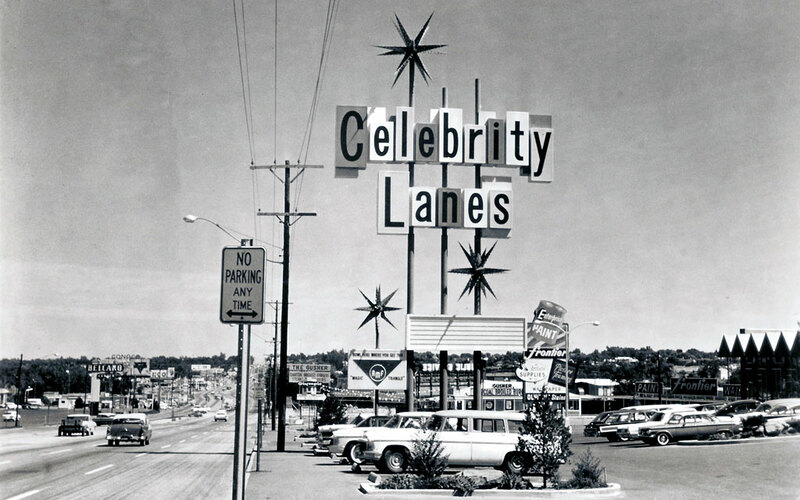 The facility took its name from the fact that it was owned by a number of Hollywood celebrities, among them Jack Benny, George Burns and Gracie Allen, Burl Ives, Bing Crosby, Spike Jones, Art Linkletter, and John Payne. And there was one other major investor, whom visitors sometimes encountered at the site once construction got under way—Walt Disney. Every time I pass by what used to be Zeckendorf Plaza, I am heartbroken all over again. Spanning the block between Court and Tremont on 15th Street, the plaza was once a remarkable example of modernist architecture. Designed by I.M. Pei and completed in 1960, Zeckendorf Plaza was a four-piece composition consisting of an ice rink, a low-rise department store, a high-rise hotel, and retail showroom with a “hyperbolic paraboloid” rooftop. My parents took me to Zeckendorf one Christmas sometime in the early ’70s. Though I was completely unaware of it at the time, the design of the complex left a lasting impression on me. There was both a coziness and an immensity about the place – shoppers streamed in and out of the May D&F department store, skaters laughed as they circled around the ice rink, the low profile and unusual shape of the showroom drew one’s eye toward the downtown skyline, and the hotel towered above and pulled it all together. Unfortunately, a developer puchased the property sometime in the mid-’90s and dismantled Zeckendorf Plaza. Though the hotel was left largely untouched, the department store was reclad in some faceless way, and the skating rink and hyperbolic paraboloid were demolished altogether. An utterly forgettable building called “The Elegant Box” now stands where Pei’s two beautiful structures once stood. Too many of Denver’s important modernist buildings have been irrevocably altered or destroyed (Pei’s Mile High Center and James Sudler’s Daly Insurance Building and Columbine Building come immediately to mind). But thanks to the people like those who created and contribute to buckfifty, I think our community is warming up to its remaining post-WWII treasures. That another of the area’s historic hyperbolic structures, Hangar 61 at Stapleton, is undergoing restoration is promising news.